Most people understand that termites are not good for their homes. These insects can cause major damage to the structure of a home. If you even think that you might have an issue with these insects, you are in need of termite treatment in Jacksonville FL. Here at Bug-Man Pest Control, we have over 40 years’ experience dealing with insects. We are able to use our knowledge and experience to provide you with the premier termite treatment Jacksonville FL offers. The colonies send out worker termites to forage for food and moisture. 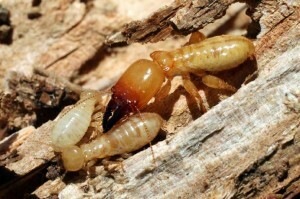 Worker termites find food and take it back to the colony. They leave a chemical trail behind for the other worker termites to follow back to the source of food. That is the process in a nutshell. Termite colonies contain a number of termite roles, such as, workers, soldiers & queens. To get rid of your termite problem we use non-repellent termiticides, which the termites can’t detect and avoid. Because we have been successfully killing termites since the 1950’s, we feel our termite treatment service is the best you will find in the area. If you have questions regarding termite treatment Jacksonville FL, please feel free to give us a call. We can answer your questions regarding our termite exterminating service. We can also talk to you about the termite bonds we offer. Please contact us today so that we can get you set up for a free inspection.